A little proud with frost, snapped as we walked. Away from our hands when we filled it with gas. Uneasy like shy people trying to avoid praise. Only more reckless. One butted a red Chevrolet. When we washed up at noon, we were more ordinary. Classroom chaos during the last days before and first days after the holidays isn't something I've forgotten. As a teacher, I tried to retain control and stay NICE. It took lots of cookies to make me think I was succeeding. 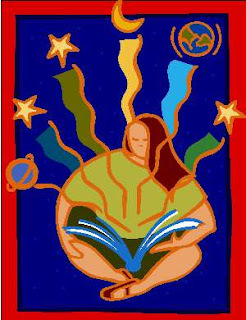 My December newsletter features Chapter 1 of a new book INTO THE WIND. They read it aloud (even high school kids like storytime), then had the kids take the survey at the end of the chapter. One teacher did this in the school's computer lab. The other used it to teacher his students consensus-building and he entered responses. If you do this, I will eagerly read what students have to say and write back. Last night, people around the world honored Velma "Wild Horse Annie" Johnston for rounding up children and adults nationwide to get their members of Congress to pass legal protection for mustangs. Last night we placed candles around a memorial stone and wished we could tell Annie that the mustangs were safe, but they would have been a lie. Last night we studied the art on Annie's gravestone. A wild mare chased to a cliff's edge stares into the abyss. The young one behind her will follow her unless the stallion at the rear neighs a command. Is he staring back at the enemy, deciding to fight? Is he looking back for our help? Whoever selected the art for Annie's grave knew the West's wild horses weren't out of danger. We need to stand watch and stand up for the last of our wild horses. During the holidays, let your friends and relatives know the wild horses are disappearing. Talk about the millions on millions of tax dollars wasted on cruelty and USE FACTS! 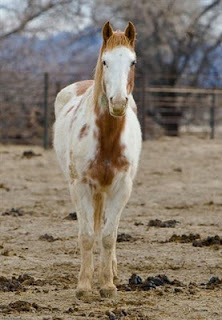 Put this link in your favorites http://wildhorsepreservation.org/ , read up on wild horse news and check back often. Dear Readers, all around the world tonight, people will celebrate the anniversary of the Wild Horse and Burro act. As someone who met Wild Horse Annie, I can tell you she wouldn't be happy at how we've allowed the intent of the law to be trampled by BLM. Every day, U.S. taxes paying to end our horses freedom. Look at Annie's gravestone, above. See the very last desperate horse looking back /-- for you. I sat down with Wild Horse Annie today. We had quite the conversation. I complained of how convoluted her law had become, how it was now a life sentence for the very animals it was intended to protect. She listened quietly, never uttering a word. “ We really need your help.” I told her. She offered no reply. The grass surrounding us was cool & refreshing, the day warm & clear. I closed my eyes and imagined a band of wild horses grazing peacefully nearby. How fitting it would have been. But alas ! Imaginings are nothing more than imaginings. There were no wild horses and Wild Horse Annie was not going to answer. Beside me was a small and unassuming grave marker. In that, it was much like the woman buried there. Beneath the name Velma B. Johnston, Wild Horse Annie, and the dates March 5, 1912 – June 27, 1977 were three mustangs, running wild and free. As I ran my fingers across the relief and looked closer at the image, I realized there was something unexpectedly ominous portrayed there. It was then that a voice came to me, a strong but gentle whisper in my ear. to return to this light. Dear Readers, On the first day I saw Ghost Dancer in the BLM corrals, fresh off the Calico Mountain range, she gave me her story. I've been writing it ever since, and I'm sharing Chapter One of INTO THE WIND in my newsletter. Interestingly, Dancer wasn't in a mare corral. I assumed -- as did Mark Terrell, the photographer who took this photo -- that the beautiful Medicine Hat horse was a young stallion. She was, after all, in a stallion pen, but she stood alone, a sacred symbol standing amid the dung, and the others kept their distances. Some of you know I bought Dancer, a "sale authority" horse. She could have legally gone to slaughter. Instead, she roams 5,000 acres of the Wild Horse Sanctuary in Shingletown, California. I hope you enjoy the first pages of her story, even if she does play them as a boy! RENO, NEVADA will join 29 US cities from San Francisco to Central Park, Canada, Sweden, and England in an international candlelight vigil on Thursday, December 15, 2011 from 4 to 6:30 pm. Join singer/songwriter, Lacy J Dalton, in honoring Wild Horse Annie and the horses and burros she fought so hard to protect. We will be lighting 148 candles, one for each horse that died due to the Calico Complex roundup of 2010 and to protest the newest Calico roundup taking place as we speak. 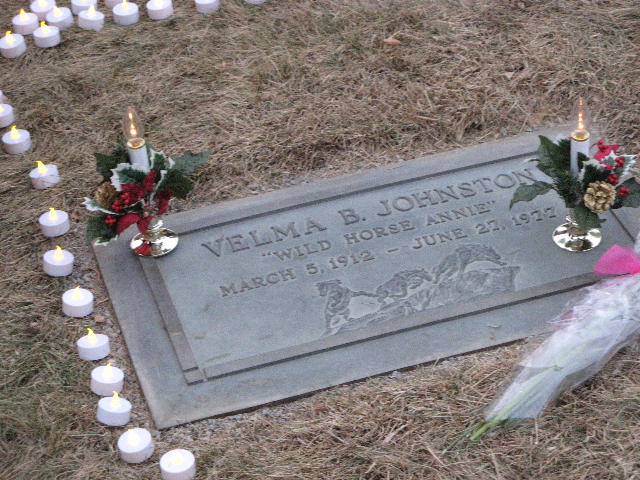 WHERE: We have the honor of holding our candlelight vigil at Velma Johnston's ( Wild Horse Annie's) grave site. Mountain View Cemetery at 435 Stoker Ave. just north of 4th St. in Reno. Be sure to use the main entrance. The road will take you to the main office,look south toward the giant white cross. 4:00 pm - Lighting of 148 candles at sundown. NOTE: Hot chocolate will be provided. You might want to bring a lawn chair, a blanket, and some hand warmers. Though we will have 148 flameless tea lights, please bring your own candle to hold ( flameless is preferred , but not required).